I am just back from another long walk and don’t have much time to get a post written. I have some ideas for some posts but they all need a little bit more work and are not quick writes. So, here are some images from the latest segment of my Virtual Hike. 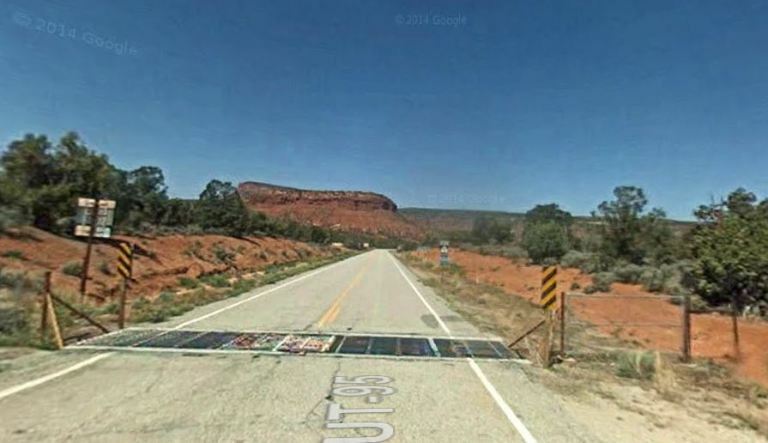 This segment is from Halls Crossing, Utah to the Four Corners Monument. The images are all from Google Maps through Street View or Photo Sphere as are most of the images I use in my Virtual Hike posts. This image and the next one are just a bit off of the highway that I have been following, but there is no Street View on the highway so I have to rely on Photo Sphere images. This is a place called Big Pour Off Spring and is very beautiful. Go to Google Maps and find this as you can pan through a 360 view from the spot. The image above is one of the ones to the left of the Google Map person icon and the one below is just to the right. This image brings back a lot of memories. I have driven across many cattle guards in my life. Especially while growing up in Kansas. You would have to be very careful driving in this area as you are entering open range country. No fences along the highway to keep cattle off of the road. The coloring of the land here also reminds me of Red Dirt Country in Kansas. After my walk tonight this is where I am on my virtual hike. I am currently on Utah 95 heading east toward 235 where I will turn south toward Arizona. I still have a long way to go to the Four Corners Monument, but will hopefully get a lot of walking in this week and make some progress toward the goal. 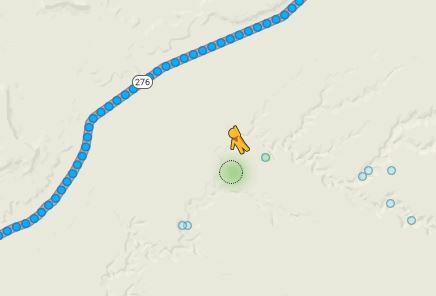 This entry was posted in Nature, Travel and tagged Big Pour Off Spring, Four Corners, Google Maps, Hiking, National Parks, Petroglyph, Primitive Area, Utah, Virtual Hike. Bookmark the permalink.